Barry and Cisco, along with Harry and Jessie, may have escaped from Earth-2, but their troubles caused by Zoom are just starting. As Team Flash mourns the loss of Jay, they have to deal with one of Zoom's other lackeys: King Shark. But this time, they get help from a few friends. This is The Flash. The Wests gather for an evening of family bonding time, but Barry is zoned out. His lack of enthusiasm pushes Wally to leave, which gives Iris and Joe the opportunity to ask Barry what's up. He thinks Wally doesn't like him, so they encourage Barry to get to know Wally. Barry leaves. Iris and Joe agree something is off about Barry. Ever since he came back from Earth-2, he's been weird. Cisco "We're going to need a bigger Flash." However, Barry is tired of waiting for the baddies to find him. He wants to go after King Shark first. Team Flash gets to work on tracking King Shark. Cisco and Caitlin visit King Shark's Earth-1 doppleganger's wife, Dr. Lambden, for help. She apparently researches (you guessed it)... sharks. Caitlin coldly demands she share her research with them, which causes Cisco to intervene. He manages to convince Dr. Lambden to help them out. Harry tries to find a way to track King Shark. Jessie finds him to talk, but she ends up helping him. Barry checks nearby water sources for King Shark, but he finds nothing. Diggle tells Barry he's doing what Oliver does--putting the weight of the world on his shoulders. (I think in this case Barry is putting the weight of two worlds on his shoulders.) Then, King Shark attacks ARGUS agents. Barry searches the area, but the meta has vanished. And now he knows they're hunting for him. 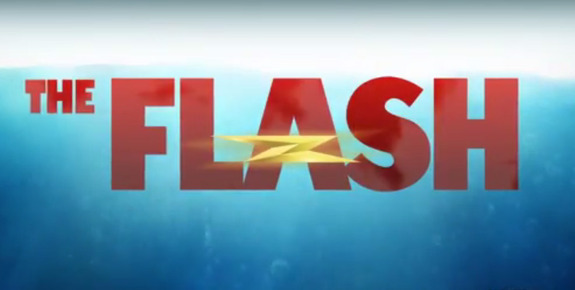 Joe races in and shoots King Shark, while Barry gets out and changes into the Flash. He confronts King Shark outside and tells him the breaches are all closed and there's no way for him to return home. But when Barry attacks, King Shark tosses him away and flees. ARGUS arrives soon after. Wally: "Jaws busts through your house like the Kool-Aid Man, the Flash shows up, and y'all just act like it’s no big deal." The West family cleans up their ruined living room. Wally is bewildered about how calm Joe and Iris are. When Barry returns, Wally questions where he went--calling him a coward. Wally leaves in a huff. Joe, then, asks Barry what is going on. So Barry tells them about Earth-2: about Iris being a cop, about Joe being a singer, about Joe hating him, about Iris and Barry being married, about Joe dying. He says it felt real, it was real. And he knows it's his fault. Everything is his fault: Zoom, King Shark, Jay's death. And now he's left Earth-2 at Zoom's mercy. Team Flash regroups at STAR Labs. Caitlin uncovers something important in Dr. Lambden's research. After a lot of science mumbo jumbo, they figure out a way to bait and track King Shark. They head to the docks and create a "Flash" pulse as bait. Then they wait for King Shark to come (while Cisco makes a lot of Jaws references). Harry and Jessie tease Cisco. (And now, I'm thinking Cisco and Jessie should get together.) Caitlin talks to Barry, promising to help him get back to Earth-2 to stop Zoom. Cisco: "Caitlin, I don't understand why I can't be the one playing Quint in this scenario. I should be the one out there, not you." Caitlin: "I need to do this." Wells: " You know Quint dies, right?" Then, King Shark shows up. But the bait doesn't quite work. (It's almost as if he saw the trap coming.) He attacks the docks instead. Barry lures him away by racing out across the water. Then he runs in a circle around King Shark, electrifying the water. He uses his speed lightning to zap the meta and stop him. The day is saved. They bring in King Shark's body. Lyla promises that ARGUS will no longer track metas to be used for potential weapons. Those plans died with Waller. Instead, they'll start looking into how metas came to be. Diggle gives Barry a pep talk about losing people. He says Barry needs to control his guilt so it doesn't rip him apart. Cisco is working on the Reverb goggles when Caitlin comes in. She touches him, and he freaks out because her skin is cold. Then she starts to talk with this icy tone. Cisco stares in horror until she smiles and starts laughing at him. He grumbles, but she tells him to stop worrying because she doesn't have the meta-human gene and she just needs time to feel right again. Barry gathers everybody in STAR Labs. He apologizes for everything that has happened. It's his fault--because he's the one who chose to go back in time to try to save his mother. But he says they will find a way to re-open the breaches to stop Zoom. He says next time he will beat Zoom. Then, he shows them Jay's helmet in a glass case. Barry: "Next time, I will beat Zoom--whoever that monster is." On Earth-2, Zoom carries Jay's body back to his lair. The Man in the Mask seems agitated, scared even. Then, Zoom takes off his helmet to reveal he's... Jay. (?!?!?!?!) Then he says, "Well, this is a complication." What did you think of "King Shark"? What did you think of the big reveal at the end of the episode?